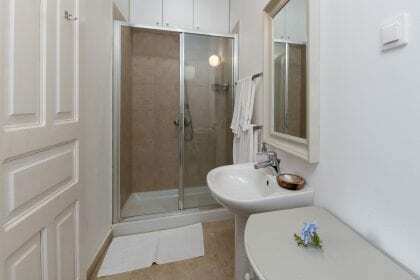 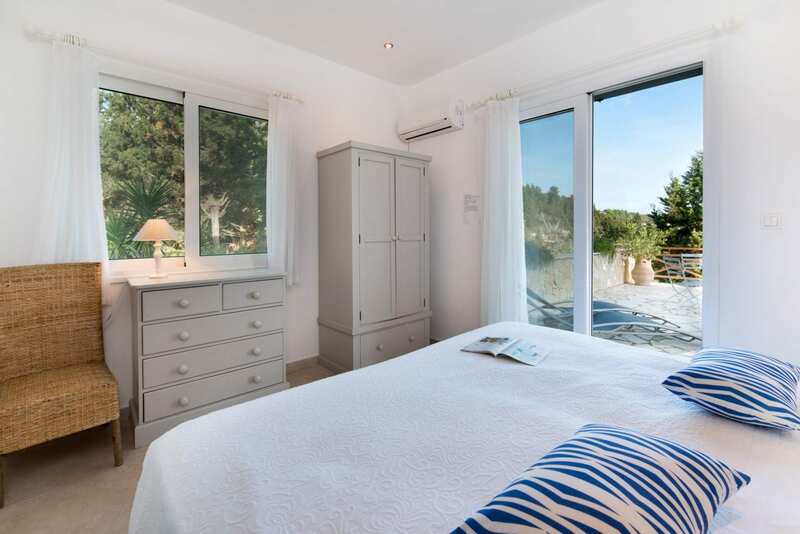 Ready for July/August 2019 – 2 double bedrooms (can be made into twins) with independent access, both with en-suite shower rooms and an adjoining door between the bedrooms. 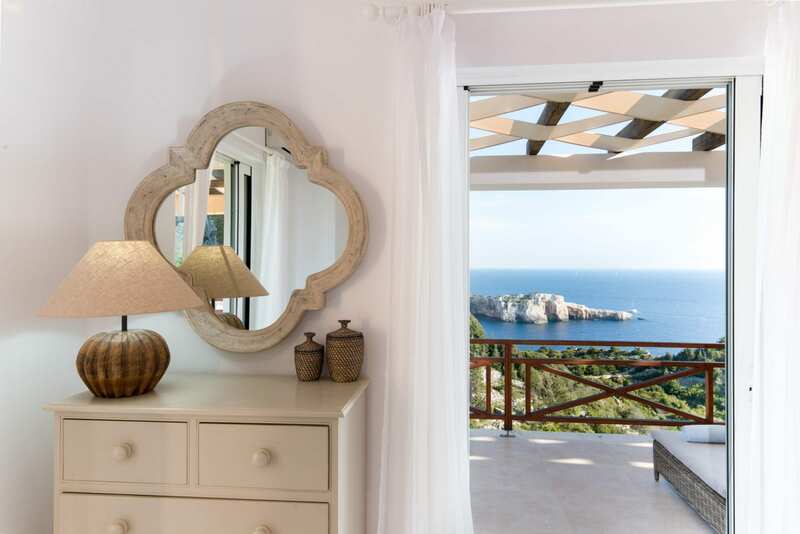 The crystal clear water of the Ionian islands has to be witnessed first hand. 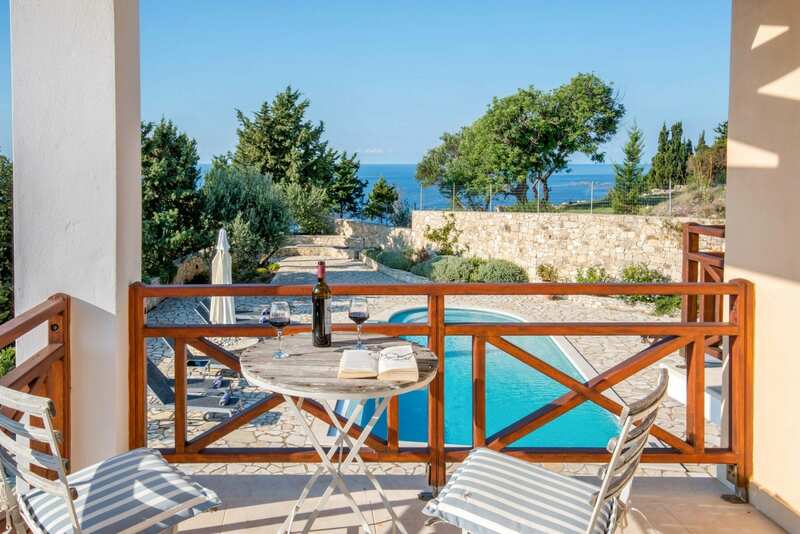 You can rent a boat and go for lunch on Anti Paxos (2km) which has sandy beaches. Boats are great just to explore the hidden beauty in every bay, drop the anchor and swim through the mysterious caves that dot the coastline. The local restaurants are of a high standard serving both traditional Greek food and some delicious Italian cuisine. 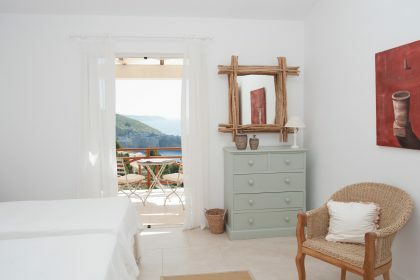 Do also visit the pretty village of Loggos on the east coast of the island and the small town of Lakka to the north. 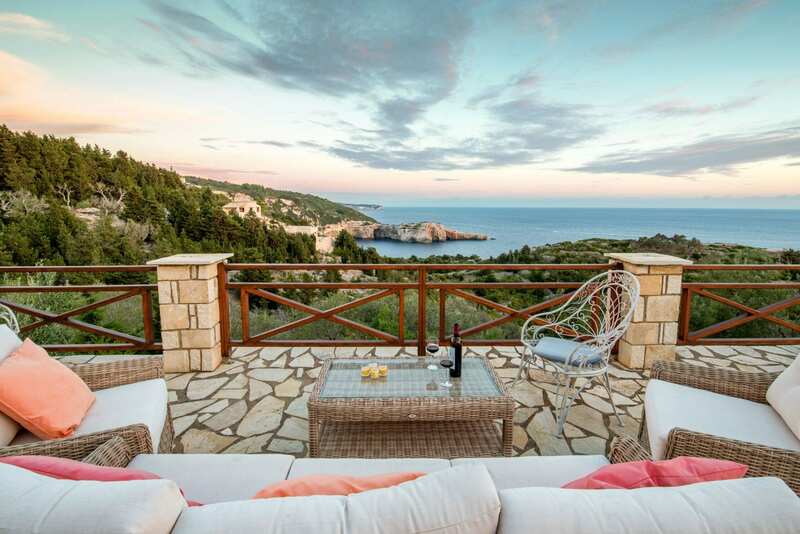 This island is a little bit of the Caribbean in Europe. 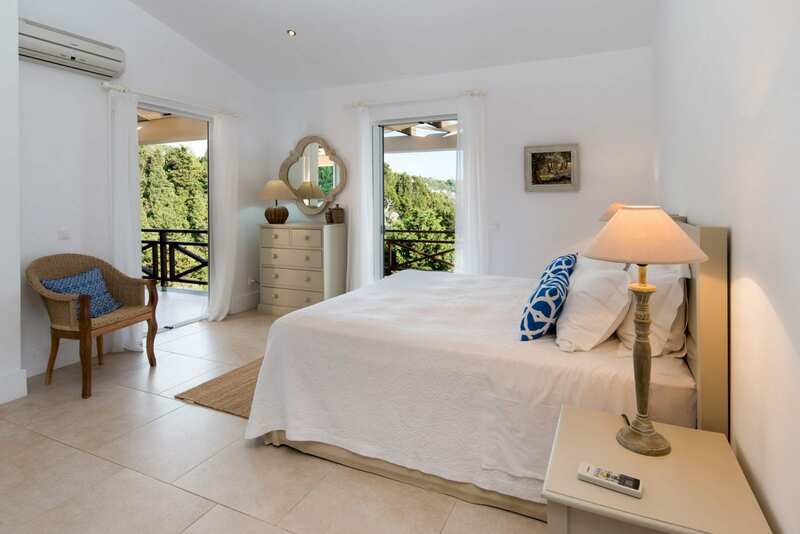 This lovely house is in quite the most beautiful part of the island. 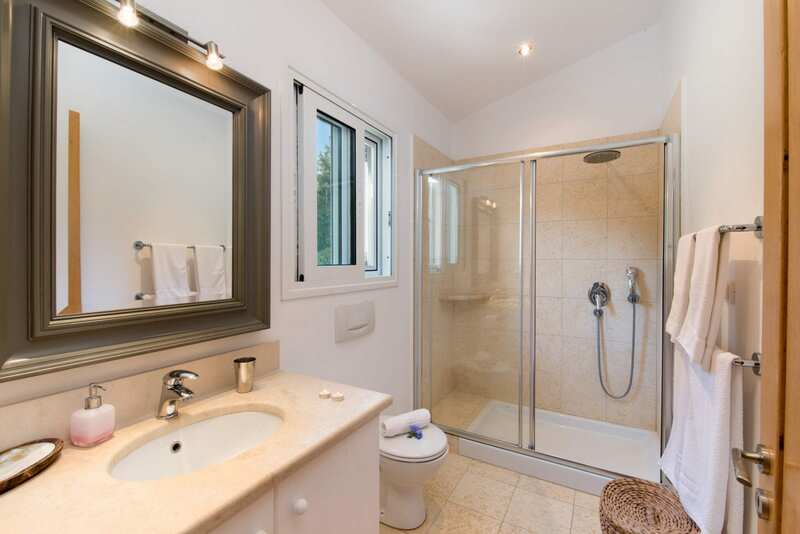 It is so comfortable and private with all creature comforts. 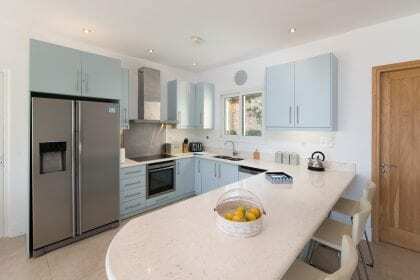 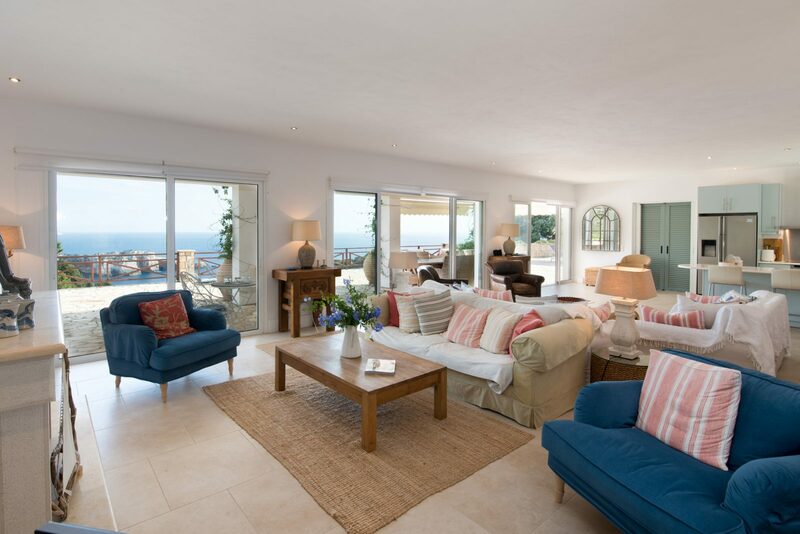 It has been carefully designed by its English owners and thought has gone into every aspect of the house. 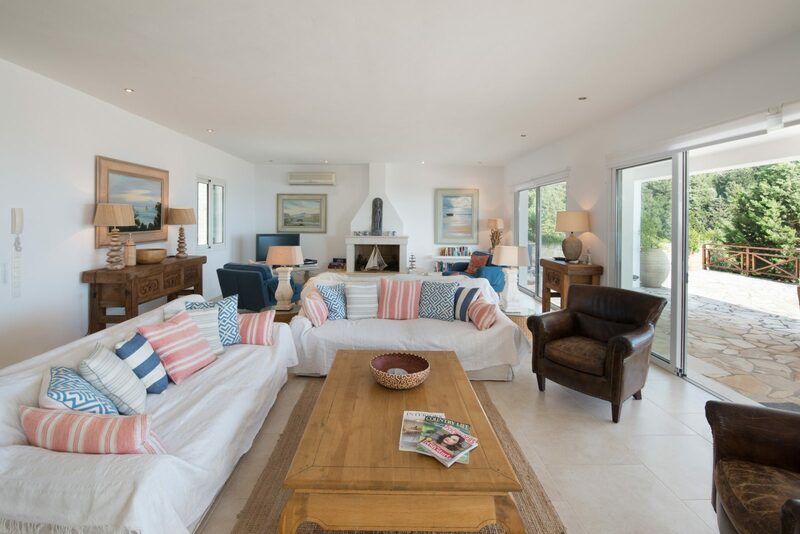 The space on the ground floor is wonderful, the big sitting room with an open plan kitchen opens onto the terrace on one side and the pool on the other through glass sliding doors. 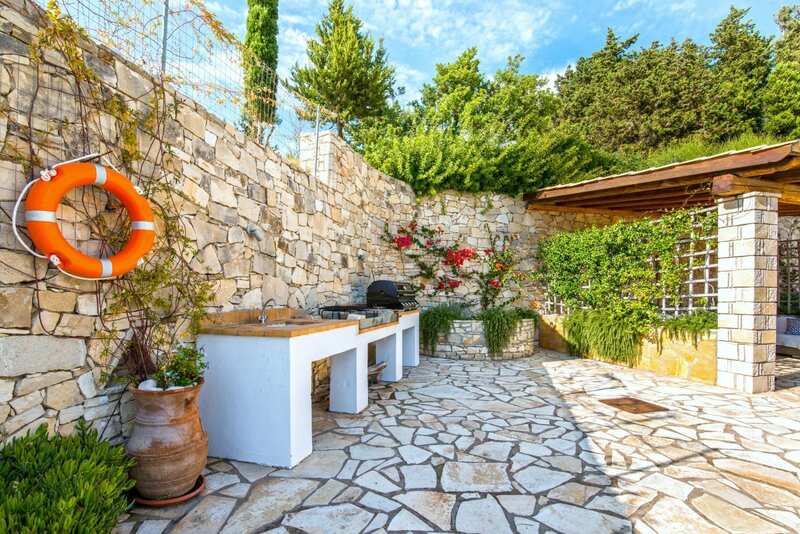 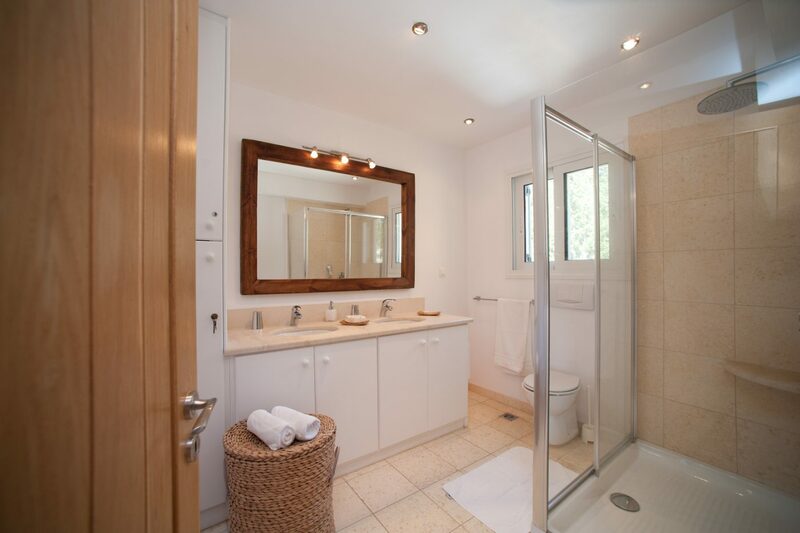 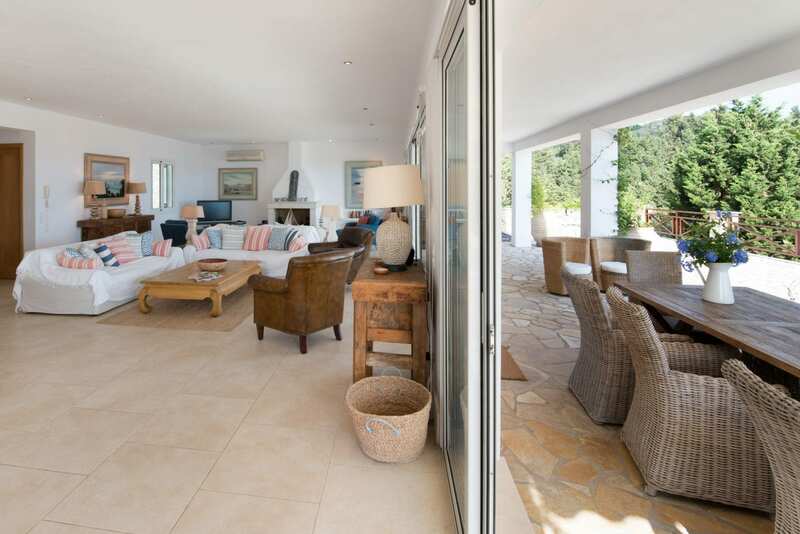 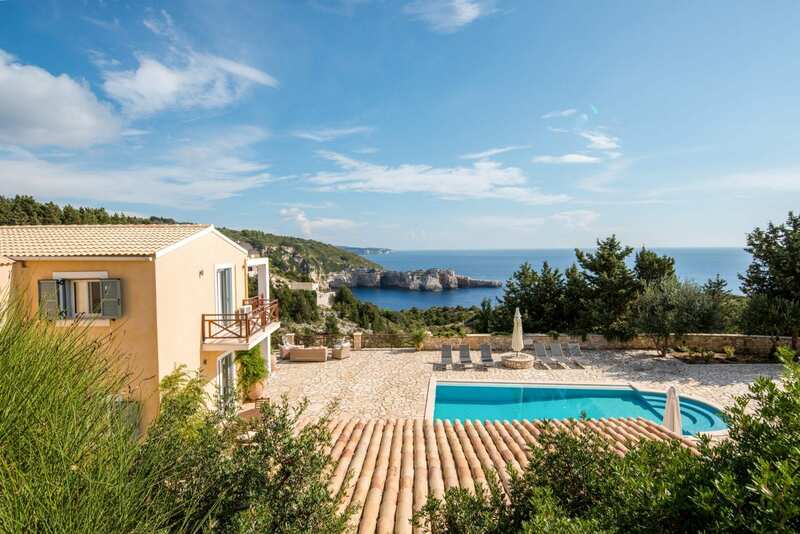 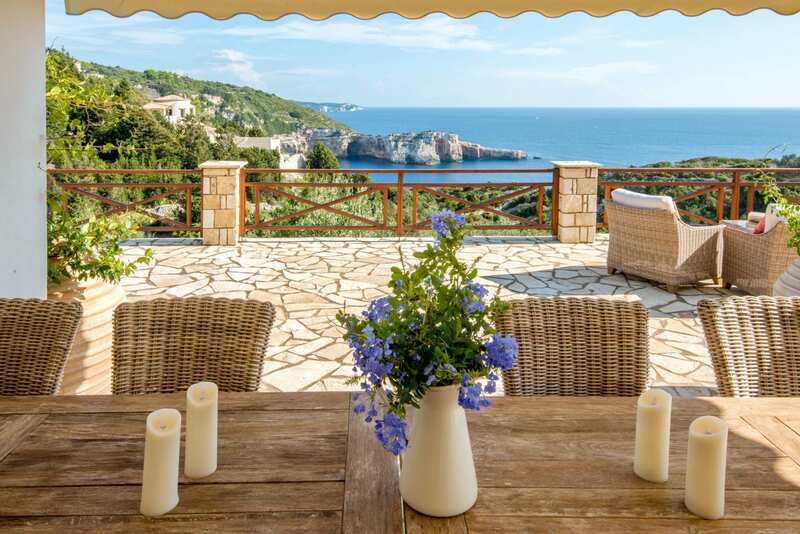 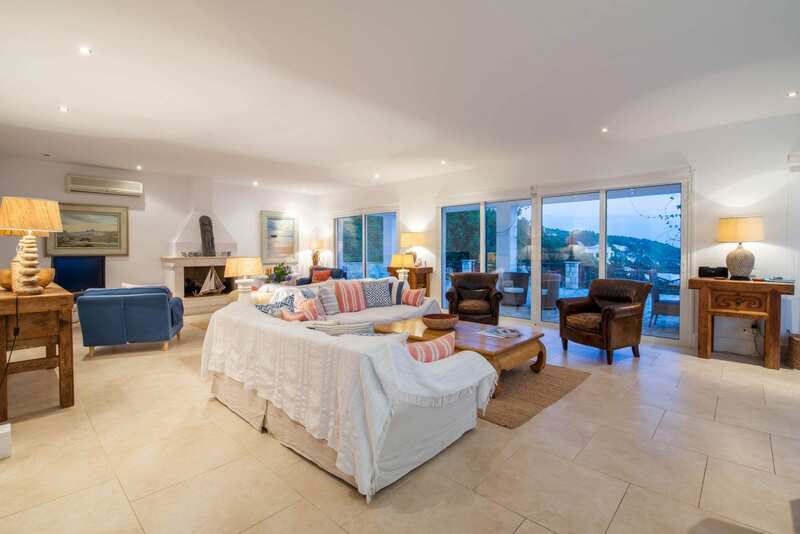 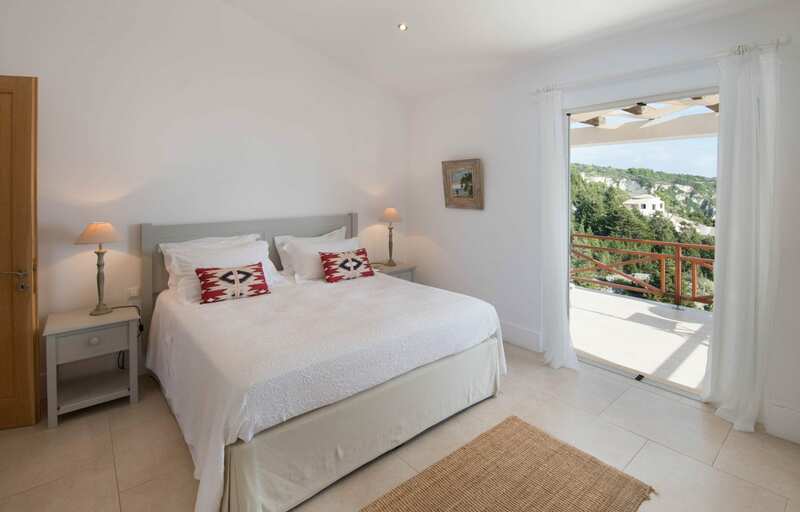 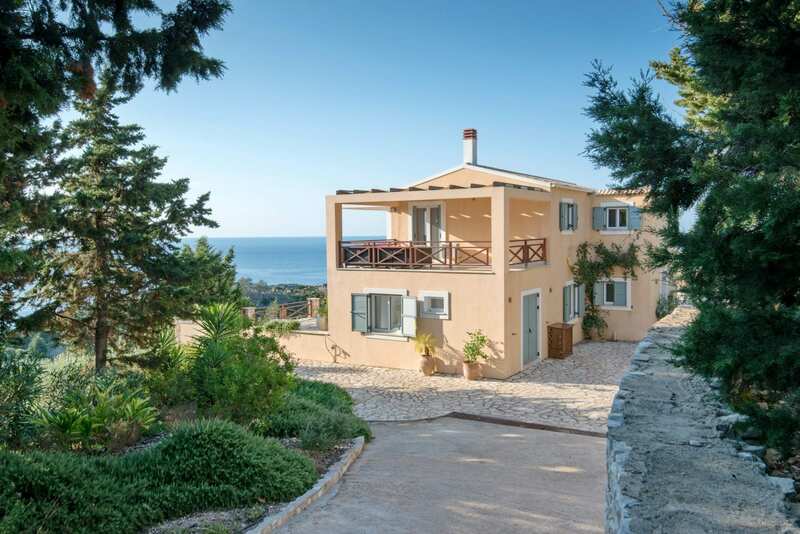 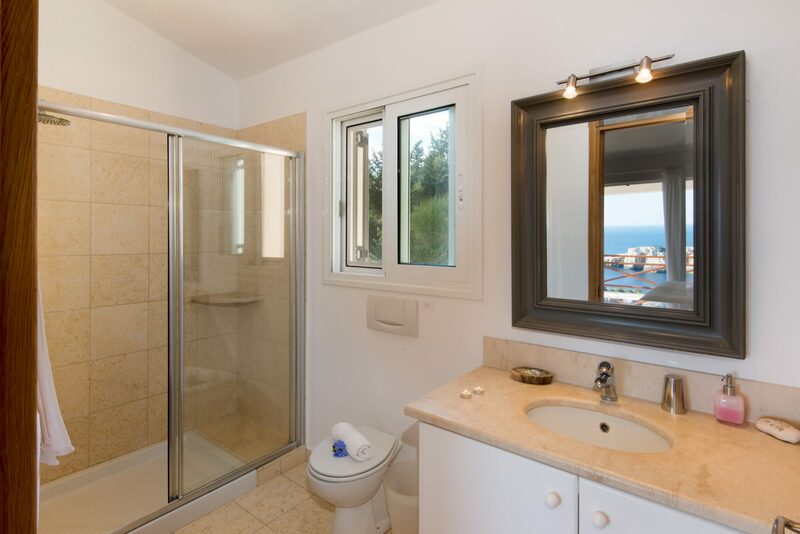 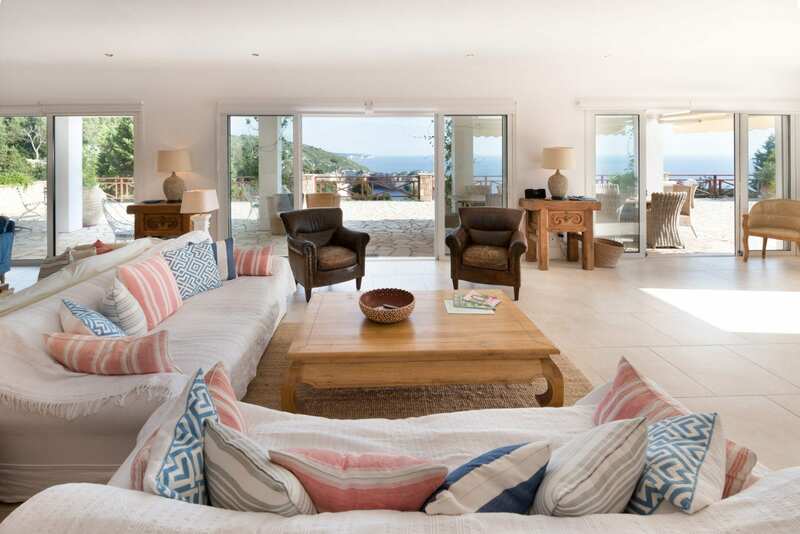 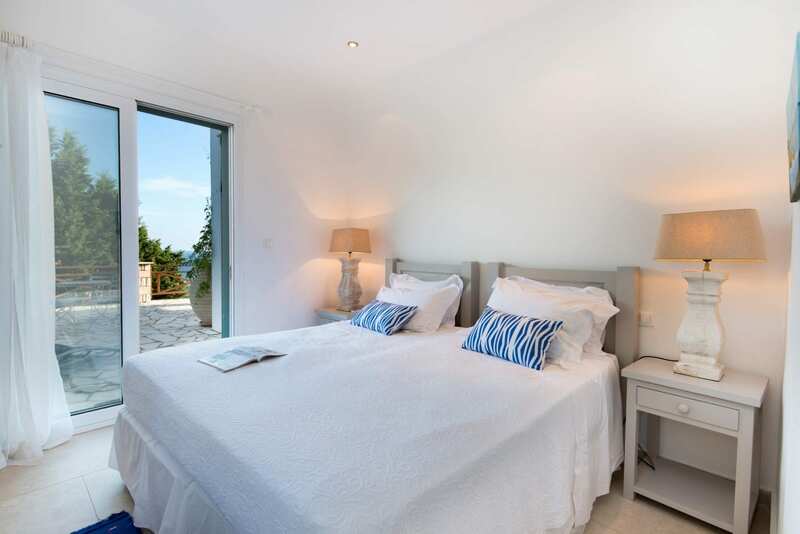 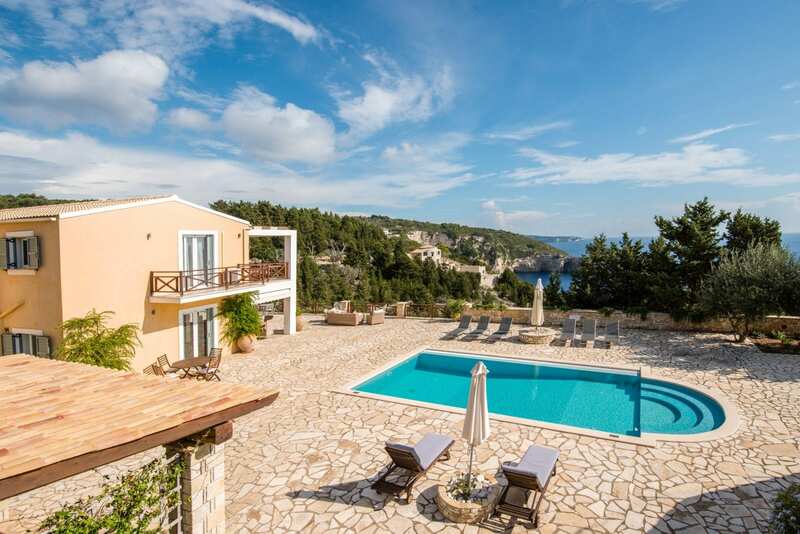 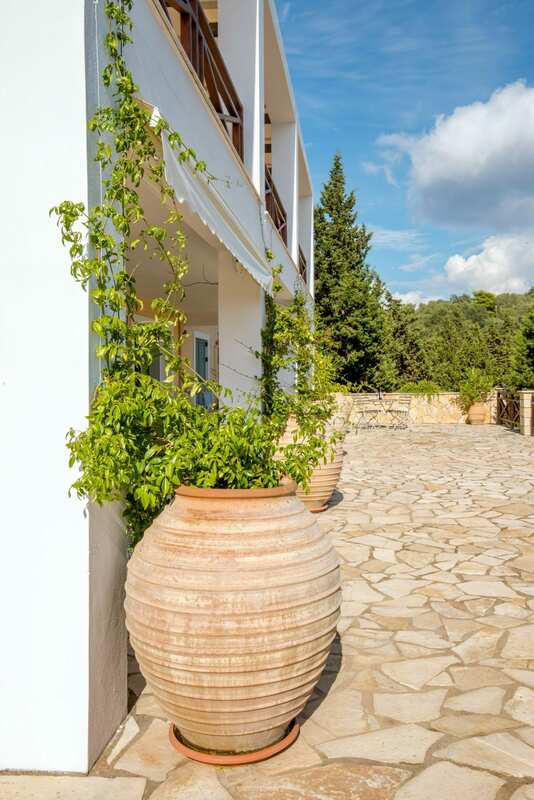 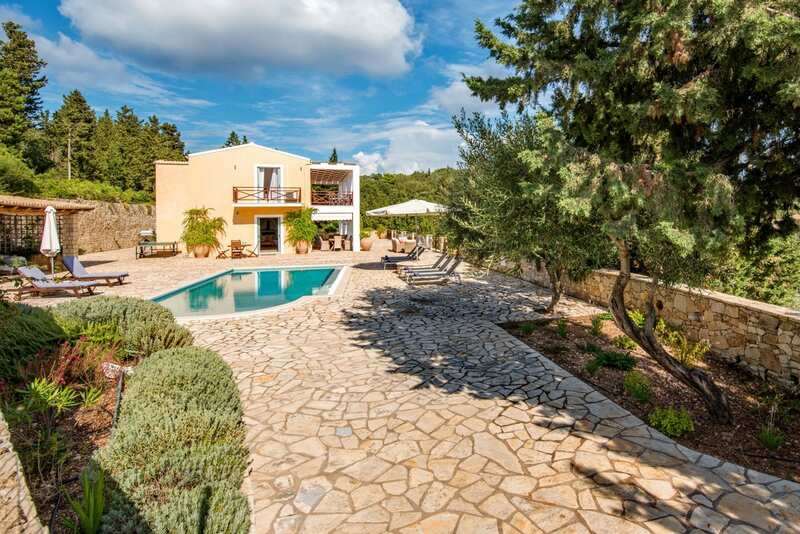 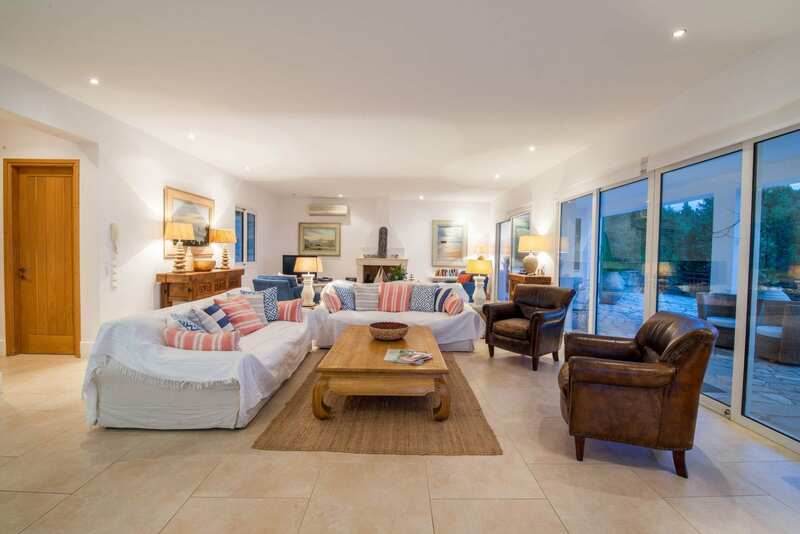 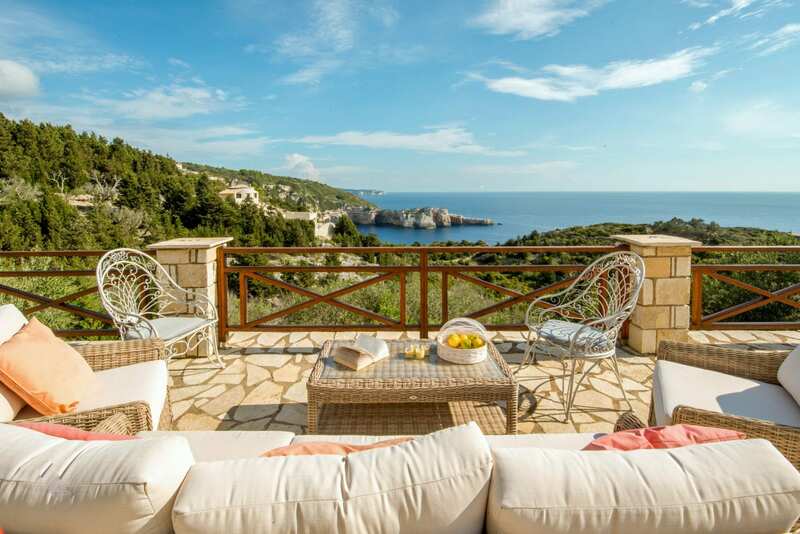 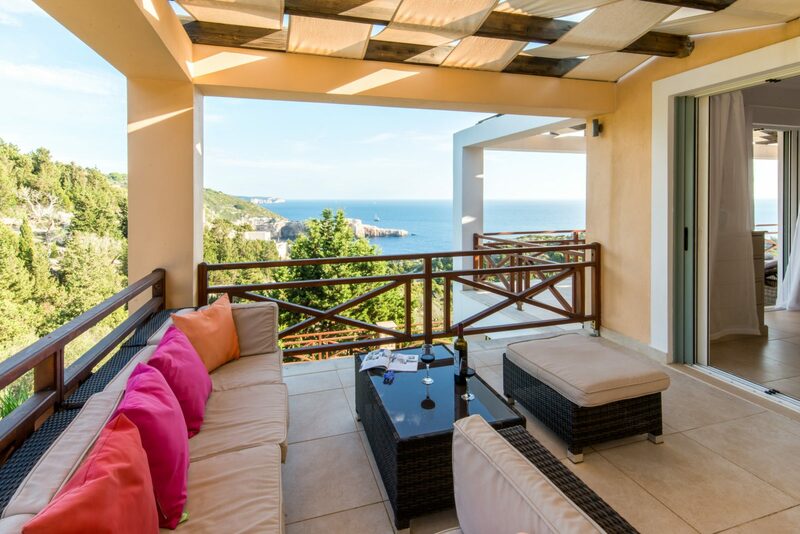 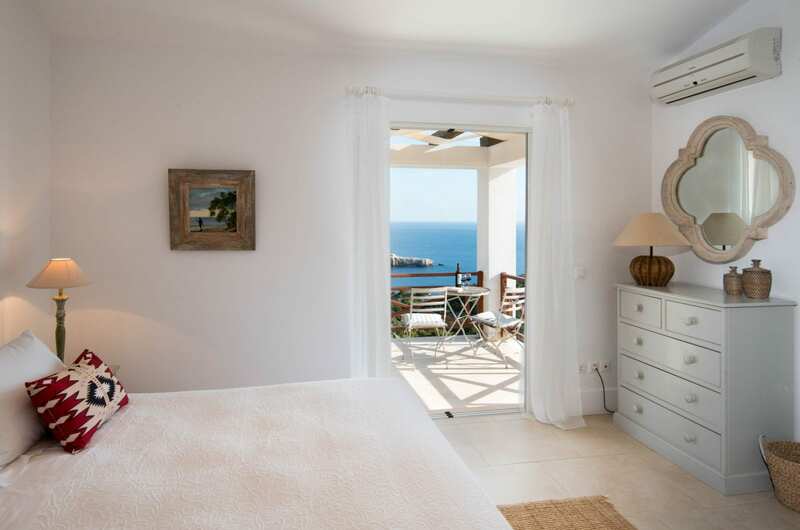 The house faces south west and has stunning views over Mouzmouli bay and across to the Island of Anti-Paxos. 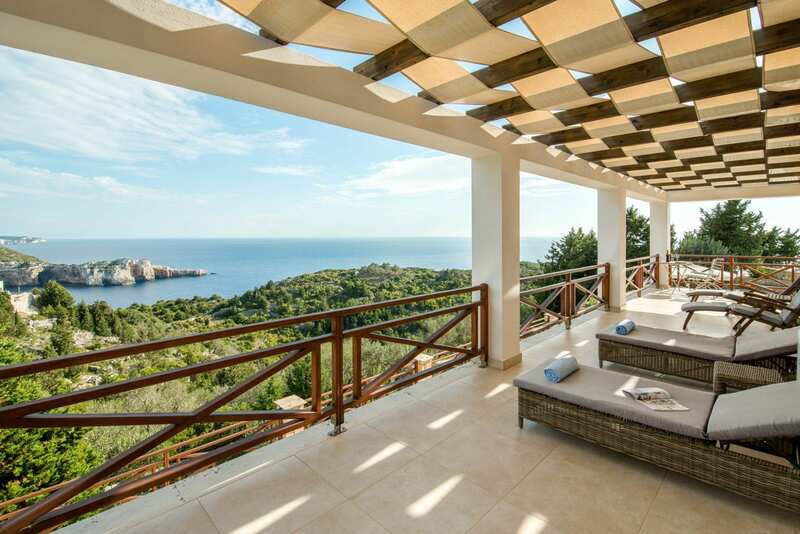 Thankfully there are several different places to relax and enjoy this unforgettable view. 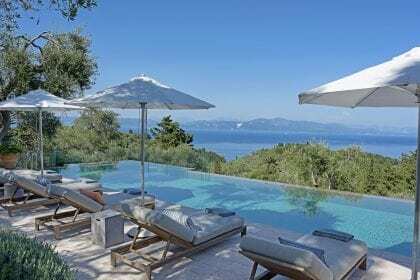 You can also either eat at the large dining table on the front terrace or beside the house overlooking the pool and garden area, planted with bougainvillea and jasmine. 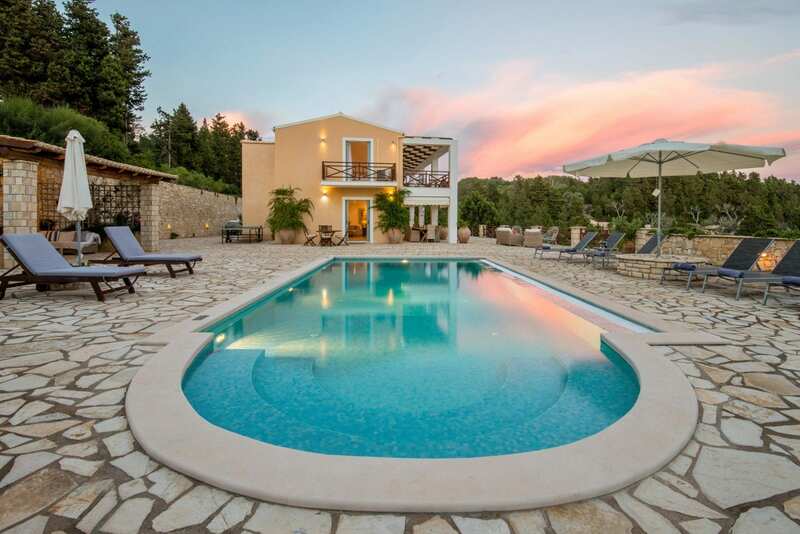 With six bedrooms (one capable of sleeping three/four) & six bathrooms this is a great house for two families or a group of friends. 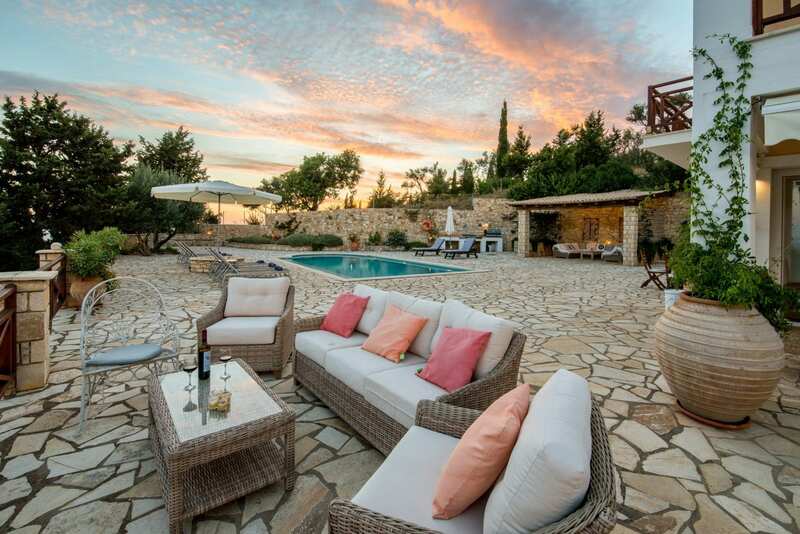 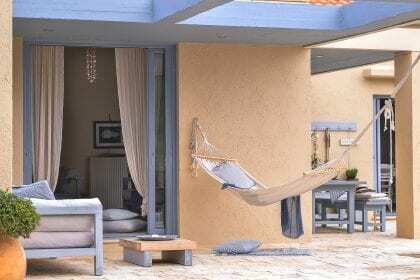 There is so much space outside that children will be able to run around happily, play ping pong or chase each other in the olive groves below the house. The nearest beach is charming Avlaki Bay which is a 15 minute walk or 5 minutes by car.